well has anyone seen this?????? they need to bring back the coupes. i will forever <3 GC8's. man, tough crowd here at i-club! lol. 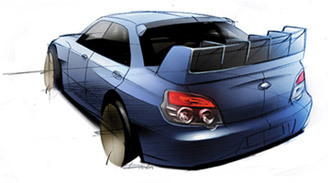 it's like you guys want that Suby quirkiness embodied in the bugeye or the traditional styling of the GC8. well, we haven't had anything like that since MY02! it's been a mixed reaction since then. I like the new features! Gotta love a sun roof, really missing it in the current STi! Also, a photo of the "plaque" would be cool!! I hate all designs later the 22b. I have 2002 sti bugeye and in the beginning i didnt like it so much but now it is the preetiest from all models. I dont know why they dont do some facelifting on that old shape 22b car. I am sure that many people would like that. Now when i look 06 car and evo9, I would like more to have evo the sub. I yust hoppe that people from Subaru are reading Subaru forums!!!!!!!! !